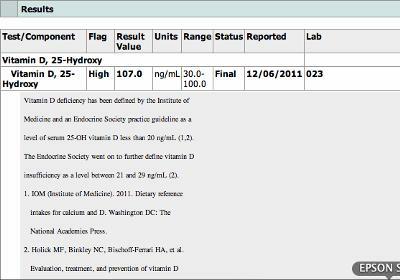 My 25-Hydroxy is off the chart at 107! What does this mean? This is copied from the lab report exactly as it appears. I'm simply looking for clues to feeling better. Is high vitamin D a flag for some type of condition? Comments for My 25-Hydroxy is off the chart at 107! What does this mean? Your vitamin d level is not 'off the charts', it's just a little bit too high. All this requires is that you decrease the amount of vitamin d that you are taking to bring this down to the optimal levels of between 50 to 80 ng/ml. You are strangely upset that this is a 'marker' for some disease or something. 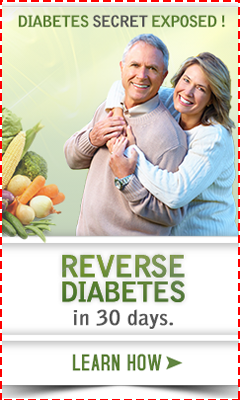 It's a marker that you are taking a little bit too much vitamin d and need to take a little bit less. That's IT. Are you getting lots of sun? Did you just go on a vacation where you got lots of sun? Do you go to tanning booths? Are you using light therapy? You don't say, but any of these would raise your Vitamin D levels since you produce vitamin d in your skin from the sun. If none of these are the case, just talk to your doctor and insist that they re do the test. It's almost certainly simply a lab error. Lab errors happen ALL the time and there is no condition in which one has a high vitamin d, 25(OH) D level without taking supplements or getting sun. 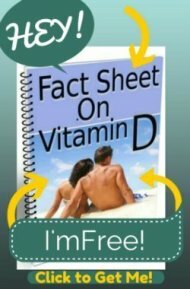 The body does NOT produce Vitamin D on it's own in the absence of sun or supplements, and there is no way to lower it if you are not getting sun or taking supplements. If it is still high when you retest, then make sure that you are not taking any OTHER supplements, protein drinks, food bars or anything else that has even a small amount of vitamin d supplements no matter how small (including milk, cheese, packaged cereal, etc.). There have been MANY MANY cases of incorrect amounts of vitamin d supplementation being added to packaged foods, milk, vitamins, etc. and that would be the only other explanation. I will ask to re test and look into the things I'm eating. Now that you mention it, I see a lot of "fortified and added vitamins" on packaging. Just ran across your question and wanted to suggest that you do some research on the ability for redheaded individuals to absorb vit D. Forgive me as I do not know if you are a person with red hair, however if you are this may be the reason or the elevated levels. I learned about this long ago in a psychology class in college, however today I was reading over my blood test results, and I have moderately high levels of vitamin D without taking supplements. I am naturally red haired, or auburn haired. I hope you have found the answer to your question. i was told by a rhuemotologist that my levels of vitamin D are through the roof yet I also have never taken a supplement in my life. I'm also told as many doctors would tell you that it could be a thyroid problem and there is no way your vitamin D levels can go anywhere near high from too much sun (your body just does not absorb enough from the sun or foods to go that high) . Yes they can go high from supplementation but like myself who IS NOT supplementing there must be another cause. It's a good idea to have your calcium levels checked at the same time as if they are high also then there is something not right. My rheumatologist is in the process of speaking with an enchro to see if it's a thyroid problem. I wouldn't ignore high vitamin D levels if your not supplementing as yes it could be another problem that shouldn't be ignored . I have had mine retested 3 times and all are sky high. what is 'through the roof'? What exactly are your numbers and units for 'through the roof'. Doctors often do not know the correct numbers and think that 'normal high' is something alarming because they rarely see those numbers.